Three weeks ago, President Thabo Mbeki insisted that most South Africans did not think the crime rate in their country was getting out of hand. Now, in his annual State of the Nation address to parliament, he has admitted that people live in fear. He has promised an increase in police numbers. It is a turnaround which compares with his change of heart on Aids. In a recent television interview Mr Mbeki said: "Nobody can show that the overwhelming majority of the 40 or 50 million South Africans think that crime is out of control." The other night in Hillbrow, the most crime-ridden area of Johannesburg, my camera team and I stood on the corner of Claim Street and Pretoria Street, speaking to passers-by. An angry crowd built up so fast that our security man advised us to leave. But there was no threat to us. They were desperate to talk about crime. One man showed us the scars he had received from a stabbing. Another said crime was overwhelming in Hillbrow. A woman told us how she could not wear good earrings or good clothes for fear of being robbed. Two days later a man was stabbed to death on the very corner where we had filmed. The government often suggests that only white people are worried about crime. "They should get out if they don't like it," one minister said recently. Our experience showed that black people are just as frightened by it. 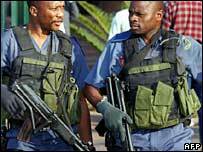 Every day, more than 300 murders and violent attacks take place in South Africa. Together with Iraq and Colombia, it is one of the three most dangerous countries on earth. But there are two important points to make. First, this is not a question of black versus white. Far more black people than white people are affected by crime, though the white population is certainly suffering heavily. Secondly, South Africa is hugely successful, with eight years of uninterrupted economic growth. Every opinion poll shows that a large majority of people, black and white, is highly optimistic about the country's future. Some believe the growth is partly responsible for the crime, since people from the rest of Africa are flowing in at an unprecedented rate. One study suggests that there are six million illegal immigrants in South Africa. Many fall easily and quickly into crime. So what is the answer? Johan Burger, a former senior policeman who now works for the Institute of Security Studies in Pretoria, believes that President Mbeki's promise to increase police numbers is not enough on its own. "The criminal justice system cannot deal with crime on its own. There has to be a holistic solution, involving every part of society. 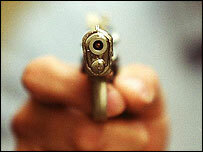 Crime goes down when societies change, not the other way round," he said. Professor Barney Pityana, the head of one of South Africa's largest universities, UNISA, agrees. "There has been a breakdown of societal values in South Africa," he says. "It is not enough to blame the legacy of apartheid. This is something we each have to take responsibility for as individuals." In Soweto, we spoke to a successful entrepreneur whom everyone knows simply as Tebogo. He explained what he did to lessen crime. "We only hire people whose backgrounds we know and can trust. We never buy stolen goods, even though they are cheaper. And we report every crime we come across," he says. It does not help when senior figures close to the government seem protected against the law. Jackie Selebi, the police chief, is still in his job even though he has been shown to have friends in the mafia. The ANC chief whip, Tony Yengeni, sentenced to prison for four years for corruption, spent four months in a comfortable open prison, and was then released. Professor Pityana says pointedly that there must be change right at the top. Yet South Africa has succeeded in transforming itself when no one thought it was possible. Now it faces another huge challenge: to end the virtual civil war which crime represents. Increasing police numbers will not do it alone. The police are poorly paid, poorly trained, and easily corrupted. Society itself has to rise up against the criminals. But it helps that President Mbeki has finally accepted that there is a problem.